#40 on Wine Spectator’s Top 100 Wines of 2018 is Cline Ancient Vines Zinfandel. Every year I usually peruse the WS list, look at the prices, and think “oh well,” but in this case, you can find this wine for around $15 at Kroger! So I picked up a bottle, and after I tasted it, I went back and bought another. My advice? Stock up on this before people catch on! Cline Cellars was founded by Fred Cline in 1982, in Oakley, California. In 1991, the winery relocated to the Sonoma Valley on a 350 acre estate in the Carneros District, and now boasts some of the oldest and rarest vines in California. The “Ancient Vines” on the label of this wine refers to their storied 100+ year old plantings of Zinfandel. It’s a well known fact in the wine world that old vines produce better wine. Unlike younger vineyards, with an explosion of leaves and fruit, growing like crazy. a vineyard with ancient vines looks almost wrong, somehow. By comparison, there are not very many leaves at all, just twisted, gnarly stumps of vines that look like something out of a Tim Burton movie. These spooky-looking vines also produce far fewer grapes, but the end result is a deeper, more concentrated flavor, more texture, and more reflective of an area’s terroir. In the case of Cline Ancient Vines Zinfandel, you have a wine so rich and nuanced, it barely tastes like Zinfandel at all! Pull the cork and you’ll notice coffee and strawberry aromas, with a sniff of vanilla and leather. Ripe blackberry fruit flavors fill the mouth with spicy cherry and licorice, and a long, slightly peppery finish. This wine has a LOT going on, and I honestly can’t believe it’s $20 online, and less than $15 locally! 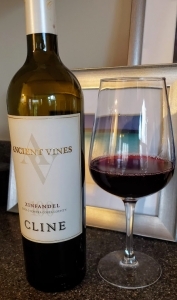 On my five-cork scale based on taste and value, the 2016 Cline Ancient Vines Zinfandel gets 4.5 corks! I give Cline Cellars a lot of credit: a wine of this quality at this price should not be missed. Stock up now and enjoy before the price goes up!